NETWORK FINALS: There were no adjustments from the preliminary Monday ratings. CABLE HIGHLIGHTS: USA’s WWE telecast was at 0.89/0.85/0.76 compared to last week’s 1.00/0.95/0.90. 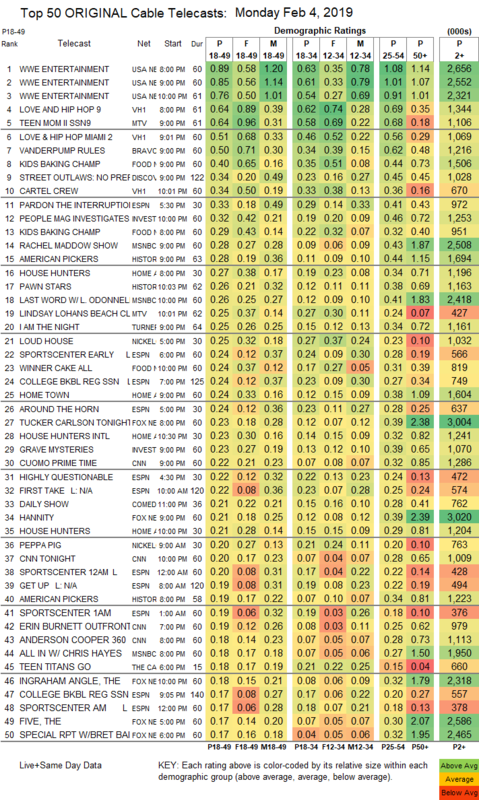 On VH1, LOVE & HIP-HOP was at 0.64/0.51 compared to last week’s 0.63, and CARTEL CREW was steady at 0.34. On MTV, TEEN MOM gained 0.04 to 0.64, and LINDSAY LOHAN’S BEACH CLUB was at 0.25. Bravo’s VANDERPUMP RULES dropped 0.07 to 0.50. On Food Network, KIDS BAKING CHAMPIONSHIP was at 0.40/0.29 compared to last week’s 0.38, and WINNER CAKE ALL was up 0.05 to 0.24. On ID, PEOPLE MAGAZINE INVESTIGATES rose 0.03 to 0.32, and GRAVE MYSTERIES was at 0.23. On Discovery, STREET OUTLAWS slipped 0.02 to 0.34. MSNBC’s RACHEL MADDOW SHOW led cable news at 0.28/0.43/2.5M, with Fox News’s TUCKER CARLSON TONIGHT at 0.23/0.39/3M, and CNN’s CUOMO PRIME TIME at 0.22/0.32/1.3M. On History, AMERICAN PICKERS lost 0.03 to 0.28, and PAWN STARS was down 0.08 to 0.26. On HGTV, HOUSE HUNTERS was at 0.27/0.21 compared to last week’s 0.29/0.28, HOME TOWN dropped 0.05 to 0.24, and HOUSE HUNTERS INTL was down 0.05 to 0.23. 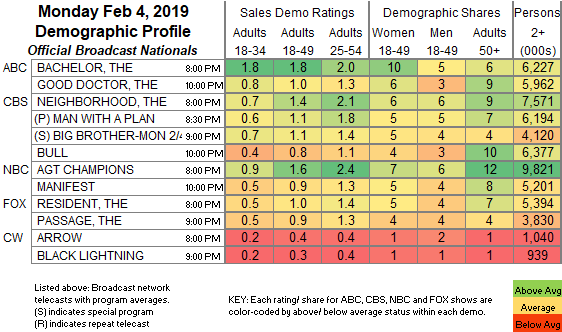 TNT’s I AM THE NIGHT ran for the first time solely on that network at 0.25, compared to last week’s simulcast at 0.21/0.24.